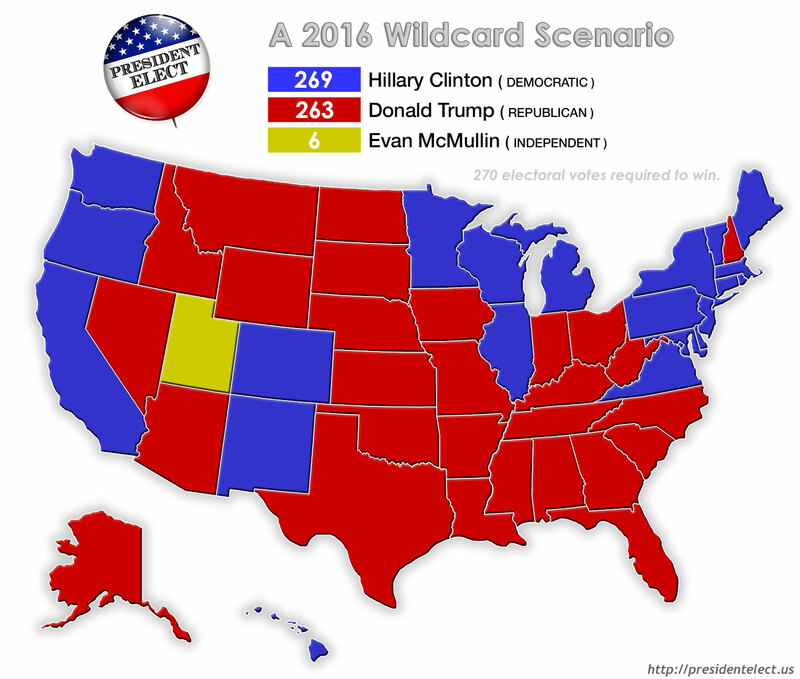 Third of a three-part series about different ways a wildcard candidate could win the presidency. Be aware that each article is intentionally written using a lot of the same wording, changing only when the particular scenario calls for it, so you can compare and contrast them easier. Recently, I wrote of a scenario where an actual wildcard candidate running well enough to potentially win in Utah could sneak into the presidency via some Congressman having second thoughts over their chosen nominee. While that chain of events is more likely than faithless electors changing the results on their own, it still probably won't happen. 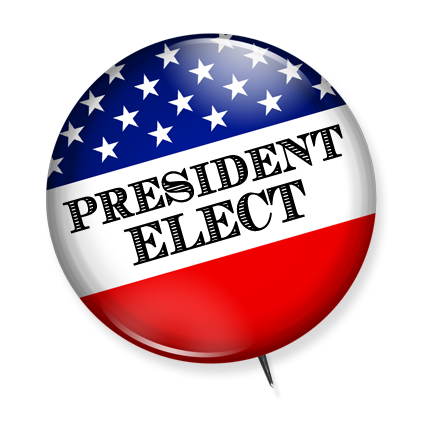 However, if it did there is another scenario that could take place that could cause unprecedented chaos in this election – an elector war among the states! What is that and how could it happen? FRIDAY, NOVEMBER 11, 2016: A few Republican insiders in Kentucky are having drinks and discussing the crazy election results. While talking about whether the House of Representatives might choose McMullin over Trump, one of them has an epiphany. "The top three electoral college vote-getters are the only ones eligible to be chosen by the House as president", he says. "McMullin has six. But the state of Kentucky has eight. What if we tell our eight electors to vote for Senate Majority Leader Mitch McConnell instead of Donald Trump? Then he'd be in third place!" TUESDAY, NOVEMBER 15, 2016: If the Kentuckians had kept their mouths shut they might have pulled off an amazing coup. But they shared the idea online and it caught on with Republican establishment types who weren't thrilled with the idea of a Trump presidency. In Ohio, Republicans in the governor's office note they can trump Kentucky with their 18 electors and put John Kasich into third place. 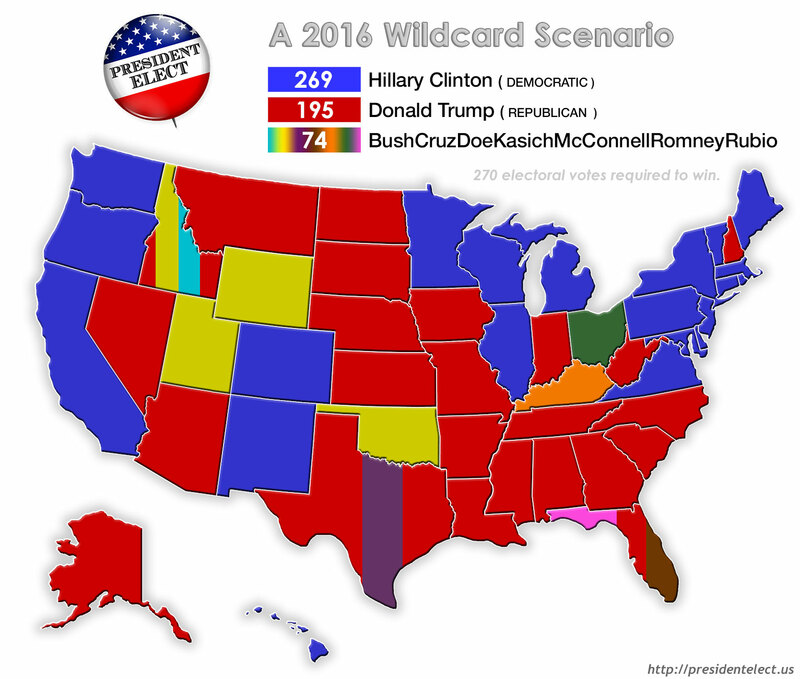 WEDNESDAY, NOVEMBER 23, 2016: In Florida, the Marco Rubio and Jeb Bush camps figure their state's 29 votes would be enough to get their man in to consideration. They start lobbying electors, hoping one of them can at least get the 19 votes they need to surpass Ohio. MONDAY, NOVEMBER 28, 2016: In New York, Democrats consider whether it might be a good idea to get Michael Bloomberg into that third spot. Their thinking is that if there is going to be a viable alternative to Trump for the House to consider, why not someone a little more left-leaning than the conservative names being tossed about by other states? THURSDAY, DECEMBER 1, 2016: Ted Cruz calls on Texas electors to band togther and vote for him instead of Trump. TUESDAY, DECEMBER 6, 2016: McMullin insdiers in Utah realize their six votes will not be good enough to keep him in the running. Since no one is talking about switching Trump votes to their guy, they know his standing nationally isn't strong enough to mount a challenge. They decide to have their electors switch to Mitt Romney. They then begin to contact Republican Party officials in other states to form an alliance among themselves to ensure enough votes to overcome what any other GOP candidate might be able to get from a single Trump state. WEDNESDAY, DECEMBER 14, 2016: Democrats decide the Bloomberg strategy is too risky. With a choice between Bloomberg and Trump, the Republican House would probably just rather stick with Trump. If there is to be a third choice, let it be an establishment conservative they can probably work with better than Trump, they decide. Behind the scenes, though, Democrats begin lobbying the four Republican New Hampshire electors, attempting to get one of them to switch their vote to Clinton, giving her the 270 she needs to win. MONDAY, DECEMBER 19, 2016: The 538 electors from around the country meet with the other electors from their home state in a place determined by the state legislature (usually somewhere in the state capital city). There they each cast one vote for president and one vote for vice president. The results are chaos! Rogue state delegations and faithless electors everywhere! Nine different people get votes, including an Idaho elector who voted for himself so he'd "be in the history books forever"! Which one ended up in third place? Doesn't really matter for this hypothetical. Take your pick. So it is all but impossible for Hillary Clinton to win at this stage. The Republicans basically will have to make a choice: go with Trump, the candidate that would have tied for the lead if Utah had not gone rogue and started this mess, or take this opportunity to switch to a more potentially palatable conservative candidate if they believe Trump will be bad for the country and/or their party.